Wow, amazingly I've done it again! I'm absolutely thrilled to announce that for the fourth year running, one of my books (US edition) has been honoured in the annual Nautilus Book Awards. Nautilus "look for distinguished literary and heartfelt contributions to spiritual growth, conscious living, high-level wellness, green values, responsible leadership and positive social change". In 2011, "Reiki for Life" won the Silver Medal, in 2012 it was "The Reiki Manual", in 2013 it was "Self-Healing with Reiki", and in 2014 it was awarded to "Living the Reiki Way"! It is fantastic to have my writing acknowledged in this way, so as you can imagine, I am VERY pleased! "Widely acclaimed Reiki practitioner and educator Penelope Quest's Reiki for Life is the must-have comprehensive handbook for self-healing and treating others with Reiki. Enlightening as both an introduction of the basic routines and an expanded study of the practice, this volume encourages the reader to realize the power and potential of each Reiki level, assists in the understanding of new techniques, and graces the topic of Reiki as a tool for spiritual growth." 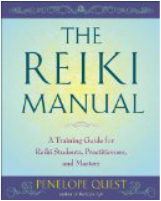 Here is the definitive resource for everyone who wants to learn, practice or teach Reiki. The Reiki Manual is a comprehensive training guide, providing structured, accessible support through each of the three levels of Reiki, covering all the essentials for students wanting to practice informally on themselves, family and friends, as well as best practice for professional Reiki Practitioners, including how to comply with the UK’s new National Occupational Standards for Reiki. There are revision questions at the end of each chapter, as well as advice on how to teach Reiki, so it is a valuable teaching aid for Reiki Masters to use during their Reiki courses. 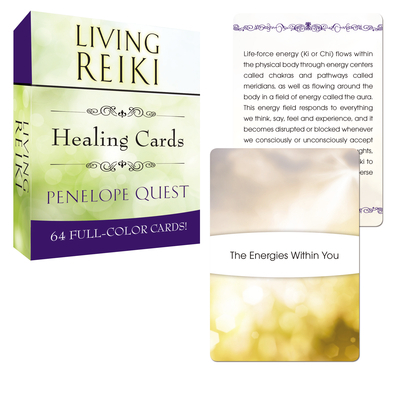 On the back cover, it states that: "Penelope Quest ... was on the Education and Accreditation Committee of the Reiki Regulatory Working Group responsible for producing an acceptable Core Curriculum for Reiki Practitioner training." Practising Reiki is not simply about healing others - it is also about healing yourself and growing personally and spiritually. In this book Penelope Quest offers practical guidance on the key Reiki Principles—living in the “now”, with gratitude and kindness, without anger or worry, whilst working diligently on your spiritual development—and how you can absorb these precepts into your everyday life to help you to achieve long lasting happiness and contentment. Published by Tarcher, 270 pages. Winner of the Silver Medal in the Nautilus Book Awards in 2014. "Each one has an enlightening thought for the day...and each card shares wisdom and life truths...I'm really pleased to own them, and happy to recommend them." "Beautiful pictures from nature, and lovely, uplifting, inspiring and helpful affirmations." This book provides a practical, clear and accessible introduction to this increasingly popular holistic healing system. It includes the history and origins of Reiki, what to expect from a Reiki treatment, how easy it is to learn, what is involved at each level of training, and how simple it is to use, including the hand positions for treating yourself, and for helping other people and animals. Published by Tarcher, 300 pages.